45 bership, & to call & preside at a meeting of the Aids: to see that at all times they are supplied with pledges. 5. It shall be the duty of the Treasurer to hold, subject to the order of the Directors all moneys belonging to the Club and he shall give a bond to be approved by the directors for the faithful performance of the same. 6. 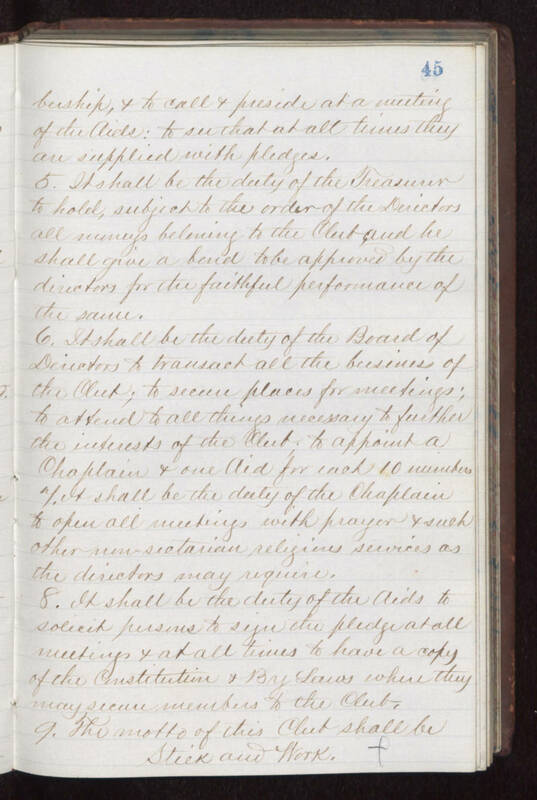 It shall be the duty of the Board of Directors to transact all the business of the Club; to secure places for meetings; to attend to all things necessary to further the interests of the Club; to appoint a Chaplain & one Aid for each 10 members if it shall be duty of the Chaplain to open all meetings with prayer & such other non-sectarian religious services as the directors may require. 8. It shall be the duty of the Aids to solicit persons to sign the pledge at all meetings & at all times to have a copy of the Constitution & By Laws where they may secure members to the Club. 9. The motto of this Club shall be Stick and Work.